Find here: posts do to with materials, yarns, needles, project ideas, and so on; pretty much everything that isn’t directly about knitting gloves themselves. Yesterday I sent off an entry for a competition but I’m not going to say what or I think it’s bad luck. And it’s also annoying to have to confess if it doesn’t get in. Actually the chances are 50/50 on previous years so we’ll see. plus there’s always knitting and crochet guild things to do and an exciting American project on the horizon. Maybe that’s why I need a day off? Since starting to write this I’ve had several days off and am now feeling more like tackling some tasks .. need to finish the armhole trim on a hand spun sweater I started altering last summer first of all. So there’s 9 projects to be going on with not to mention designing the show that I’m going to have at Prick Your Finger in Bethnal Green. That starts on 13th March. That is a week on Friday so not long now although it’s all being planned out on the spare bed! As I’ve bought a new camera I decided to spend a bit of time photographing (at least) some of my stash. The stash facility on Ravelry sounds very good and I haven’t really used it up to now and it would be handy to know what I’ve got when thinking about new projects without having to root through the tin trunk that keeps it all. So I started on the 3ply wools, those I use for gloves usually. I have just counted from the photos and there’s enough wool for about 60 pairs I think. The colours are rather unevenly distributed, lots of yellow and hardly any white. I try to make it a rule not to buy more yarn but like all rules it can be broken, especially when Marion Foale’s colours are so wonderful. At about 6 – 7 pairs annually that’s about enough for 10 years. I think that sounds just about right as I’ve certainly got that many ideas and I might even start knitting at least part of them on the machine. You can look on my Ravelry pages to see what’s there so far. There’s 4 ply, enough for a couple of sweaters, and some denim cotton, a tiny bit of cashmere, some DK in various colours and that’s about it. I’ll add them another time. Here’s some of the more photogenic balls and skeins, from the early 1950s to the mid 60s I think. All pure wool and all spun in the UK. All in imperial weights too, so a bit of the past in some balls of wool. A skein of about 4 ounces, again from the 1950s? Patons and Baldwins, Purple Heather, possibly from the 1950s? Someone else obsessed by gloves! Fiberarts was a journal published in the USA from the 1970s through to about 2008. Those dates may not be completely accurate but they’re enough to give you the idea. I thought it was the most wonderful read. Evey issue, almost. was packed with great textiles, a lot of it fiberart as you would expect but also crafts, exhibitions and making. I came by a stack of these in the depths of the collection of the Knitting and Crochet Guild, and not featuring knit or crochet, or only very occasionally, they were deemed to be surplus to requirements. They then sat in my house for some months until I got round to going through them. Glen’s gloves, a whole page article in the September/October issue, September 1985 caught my eye as I was filleting them prior to passing them on to a friend of mine who is an artist, printmaker and paper maker. The piece is about a textile artist called Glen Kaufman who had been using the glove as a format for exploring ideas. He exhibited in the 1974 miniature textile exhibition, organised by Ann Sutton, and which I think I saw in a mill building in Wakefield. Glen Kaufman called the gloves special exercises in ‘small thinking’ and this particularly resonated with me. He did not always construct the gloves but used ready mades from thrift stores (charity shops). There is an interesting article about the significance of the glove as a piece of clothing – from ceremonial to workwear in Knitting Traditions 2010, reproduced on Knitting Daily here. Thought that I’d do a few rounds before turning in and just realised that they’re wrong … I did not look at my chart and just carried on. So now I have to undo about 8 rounds and get it right. That is actually part of the appeal of this knitting – it has to be correct or not at all but just now I could do with some way of fudging things. In the morning I might take some photos. Once I’ve completed the gloves I’m knitting for my friend Sharon, the third in a set, three friends from Yorkshire, three Yorkshire gloves, I’m not sure I’ll carry on with this format. I do have more friends who would no doubt like a pair of cosy gloves but I don’t think it’s going to happen, or not just now. What am I going to knit next? Well I’m very drawn to the idea of text on mitts or gloves and this is an idea I’ve explored in my sketch books. There are other designer/knitters who have gone down this route and I am wary of appearing to copy in any way. Formal exploration of colour mixing using the three primary colours for pigment – red, blue and yellow, so beloved of the Bauhaus. using any two of the three and small patterns, the effects of mixing them might be interesting. This sort of fabric, if not the construction could be knitted in the machine though, and much more fast. Text / words / slogans as discussed above. Environmental commentary: numbers of say, birds or species and dates and numbers, most often in decline. Constructing designs using patterns from historical Welsh textiles – I did this a bit with a couple of early pairs, but there are more pieces in the National Wool Museum that would provide inspiration. But these need to have recipients, there is no point in knitting gloves that will never be worn. I’m travelling to Falmouth to give a presentation about what I call The Glove Project (TGP) on Thursday as part of a conference called All Makers Now and I rather hope that speaking there might nudge me in a good direction. Magic loop – I was wrong! I’d always steered clear of magic loop for using circular needles and it wasn’t until I saw someone doing it properly that I realised I had been doing it wrong when I’d tried it. So I’ve been using it with only one circular for the fingers of the last pair I finished and also started a new pair using it. I was puzzled that people like EZ and Meg Swansen used it when I thought that it stretched the stitches out too much. It does if it’s not done correctly. The only downside is that I now need longer circulars for there to be enough room for the ‘magic loop’. 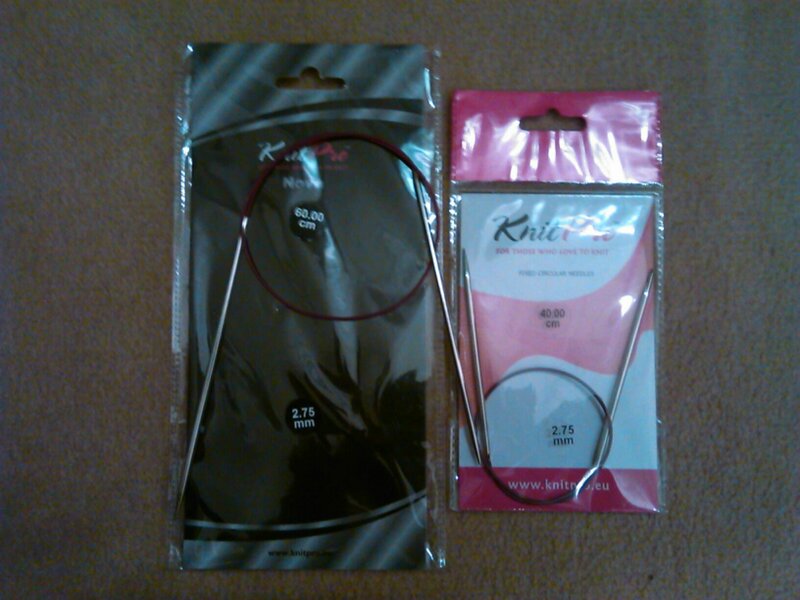 I have ordered a couple from Purl City Yarns in Manchester – the new budget Knit pros, aluminium on special offer. Since I started knitting gloves in earnest, March 2011, what have I done? Blogged: this blog and a few Tweets! I have a VERY STRICT rule about not adding to my stash of yarns (as opposed to the one of fabrics). I go into yarn shops and do not make myself popular by saying ‘Well, I’m not buying any yarn because I have a strict rule that I’m not adding to it’. Actually I only have a small tin trunk full of yarn, whereas I have seen pictures on blogs of whole basements being used to store yarn stash, more like a shop, and not a small one. However, after being in Cornwall I travelled up to Derby on the train where I went to the Knitting and Crochet Guild annual convention and AGM. Actually I only went to the AGM but that’s another story. There were lots of great things like a de-stash table, a raffle where one of the prizes was ‘The history of Hand Knitting’ as an audio book, and surplus items like books and needles from the collection being offered in return for a donation. And these lovely 4plys were not bought by anyone else and came back to Lee mills so I had to give them a good home. Vintage Jaeger 4ply pure wool, what could be better? I’ve spent a lot of time recently taking photos of my knitting and the pieces in the Knitting and Crochet Guild collection. Of course, these are all for different purposes – the most recent batch of mine are for entry into an art show while the collection pics are just for identification purposes while we are going through a first round of cataloguing at Lee Mills. There is some useful advice out there on the web, some of which I picked up a while ago like buying daylight bulbs with an exact light temperature and a large piece of grey card to use as a background. I think that lights and the arrangement of the pieces are more important than the quality of the camera, as even the most basic point and shoot digital has such a range of settings. So here’s an attempt from this morning – a couple of pairs from a year or so ago with the fabric that gave their design inspiration. Lost gloves – my own! These are pure wool knitted a few winters ago. They now have a darn as I fell over and made a hole. They also got lost last week, hence the photo of them outside a local shop where some kind person put them. 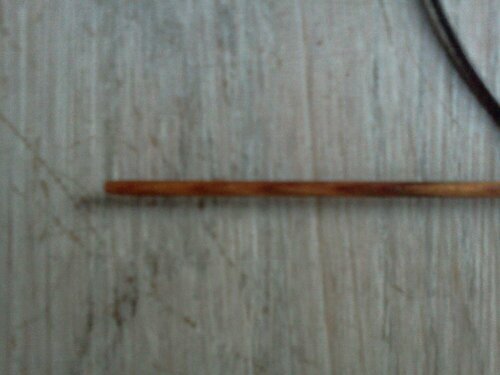 The broken tip of one of the circulars I was planning to use – it’s like a Knitpro but I bought it in the States I think and it’s a different brand. Bought metal rather than wood as I have broken two tips in the last few weeks. I went to Purl City in Manchester where they have a great selection. Bought 4 x 2.75 so I can have both gloves on the go at once. It’s the only way. When I started knitting these gloves one of my aims was to do something that I had not done before and also to do something difficult. I had in mind ice skating – which I have never done, but have watched a lot of on TV – where marks are awarded on artistic impression and technical ability. at least that’s how it was when I used to watch, about 20 years ago, and always on late at night. 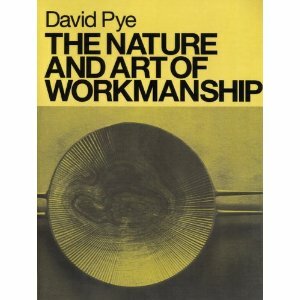 When I was a design student, anything that relied on technique was dismissed as only technique and for many years I held that view. A bit of me still does. If you have ever seen what the knitting machine companies advertise when their machines can do you will see what I mean. But having seen rather too many very undemanding knitted pieces in the crop of recent magazines I decided that I would knit something difficult. Hence the gloves. I was surprised to find that a similar impulse had been driving Alan Rushbridger, the editor of The Guardian, not to knit, but to learn to play a particular piece by Chopin of great technical difficulty. Being a journalist he has written a book about it – Play it Again: An Amateur Against the Impossible. I haven’t read the book, but this is the review in the Financial Times, In some ways learning to knit these gloves has been a similar challenge for me – although I’m not working full time as he is, making time of the right sort is still a problem. I think it’s interesting that the same sort of idea has driven two very different projects. I’ve achieved my aim of knitting three pairs before March 1st. I have also tried to take better photos of them with daylight bulbs and a (very cheap) tripod. Over Xmas and the New Year I have been with at least three friends who didn’t have any gloves, or not very good ones, or who needed a birthday present … so I’ve decided to knit gloves for them. It takes away a whole lot of decision making. I got all the family and friends that I could to draw round their hands with a pencil on A4 paper and add their favourite colours, full initials and date of birth. So now I have size and colours for at least 11 people, plenty to be going on with. Uneven stitches, or the mark of the hand? Every now and again I get a row or round of stitches that are too loose or too tight and which therefore stand out. These gloves are very fine and some people’s reaction is that they must be made on a machine. Of course, you cannot produce coloured knitting in the round on a machine (that I know of, I’m sure it’s possible, even if not economically viable for production). But what about these irregularities? I thought that they would come out after a press or wash but they don’t seem to. So for now I’m thinking of them as the mark of the hand, if that’s not too much of a pun. It’s quite relaxing actually as I’m not worrying about losing them and I’m also getting design ideas for some future pairs. I think maybe hearts would be good. They have been used on gloves before, like the ones in the National Museums Scotland. I think these are amazing. They have been discussed on the Ravelry Sanquhar knitting group pages too where they are much admired. It seems that not much is known about them though. Getting the right sort of yarn for knitting these gloves has been difficult – the right thickness and quality, not to mention a good range of colours. 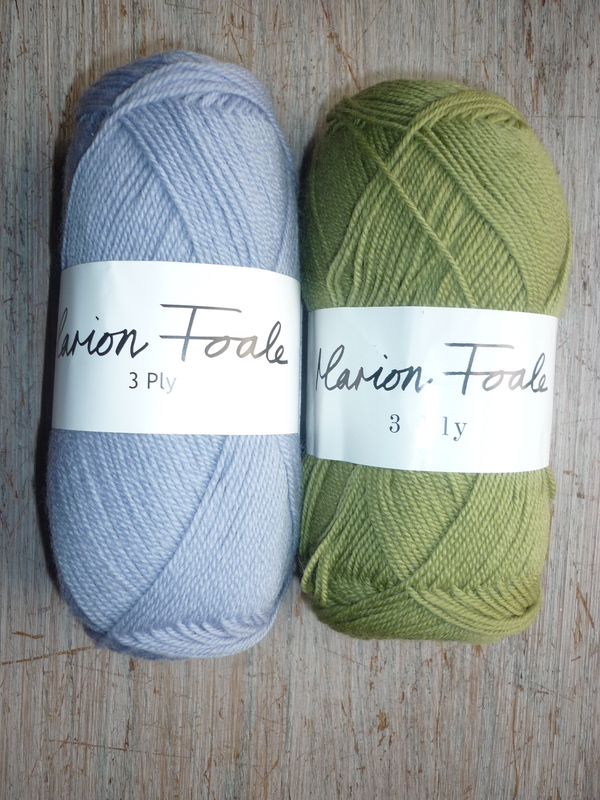 However, I found that Marion Foale has a 3ply pure wool, spun in the UK (although not UK wool). The range of colours is excellent as you would expect. I think it must be what is used in the range of hand knits that are sold as garments. Yesterday at Lee Mills, the home of the collections of the Knitting and Crochet Guild, my colleague was sorting the final few of hundreds of boxes of knitting patterns, possible the largest collection anywhere (in the world?) 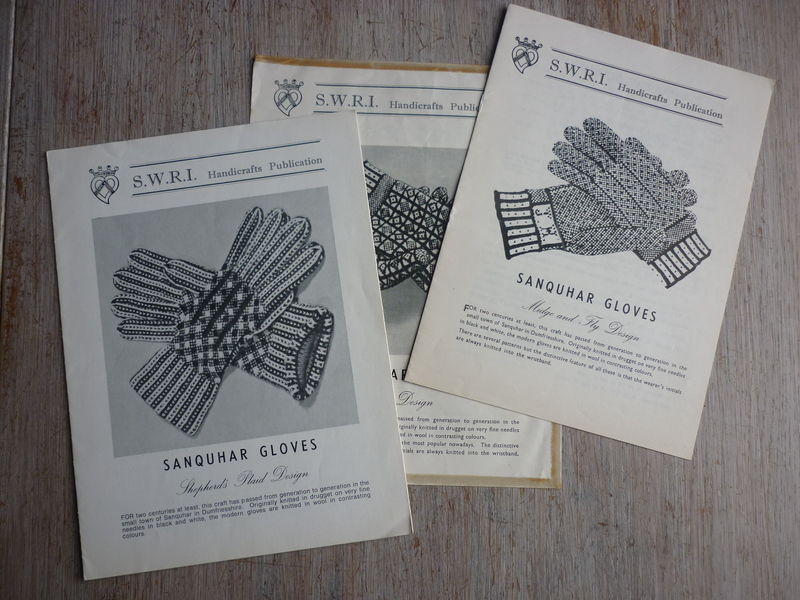 found 3 of the original SWRI patterns for Sanquhar gloves. If you send away to the SWRI for these you get photocopies, which although legible, aren’t ideal. So it was really interesting to see the ‘real’ patterns – slightly smaller than A4 and printed on shiny paper. I have been able to borrow them to look at closely. A conference I didn’t go to! I’ve just spent the morning writing an abstract for a conference about making and researching at Aalto University, Helsinki in November, The Art of Making 2012. I’m hoping to make a presentation about the glove knitting and all the processes that have been gone through in their construction and in the information gathering about them. It’s peculiar trying to think and write about making – I’ve been listening to an interview with Neil Young, the Canadian singer songwriter and he insists that all that he does is instinctive and not thought through. Why do makers need to articulate what they are thinking when they are making? Or artists? Or dancers? Or actors? Is the reflection done through personal memoir or through interviews or what? Or perhaps never? I’m in New York visiting my step daughter and family. I was able to take my knitting on the flight after having check in query it with security – it was only four short wooden needles that I did one thumb on so not too alarming. I had a good sort out this morning and did an extra round on one of them before sorting out stitches for the fingers. I’m back now but made some progress while over there although it really was much too hot to knit with wool. I visited only one knitting shop – that’s how hot it was! That was the one nearest where I was staying in Brooklyn. It’s a very pleasant space run by two very nice people. It’s called Argyle Yarns. I called in one day to check if they had any groups – which they did – there was one on the Saturday afternoon but run by someone just renting their back room. It seemed to be an excuse for eating and drinking a lot – although a glass of white wine went down very nicely. Coming back I took knitting on the plane with wooden dpns and a circular and it didn’t cause any problems. I have written a paper about knitting these gloves for the Journal of the Textile Society, Text, and I have heard that it has been accepted. I chose to knit these gloves with a view to writing about the processes involved and the article combines some history of existing gloves, some description of those in collections and some comparisons of my making processes compared to those written about by David Pye in ‘The Nature and Art of Workmanship‘. I’m still grappling with ideas of practice and making as research and quite how is best to discuss them, and in fact, if it is necessary at all. However, if it adds weight to what people do with their hands I’m all for it as I feel that hand skills are undervalued. I’m in South Wales and have visited a couple of knitting shops, one in Llandeilo and one in Fishguard. I’ve bought MORE needles, circular Knitpros, 2.25mm in 80cm length, Llandeilo, In Stitches, and then 2 pairs of 60 cm long from Jane’s woolshop in Fishguard. So from knitting on what I had in my stash of needles I am now knitting on shorter ones which definitely makes life easier. I’ve never understood the phrase ‘a poor workman (sic) blames his tools’ as it seems to me that the right tools for the job are essential. If you’ve tried knitting using rough or damaged needles, or ones that are too long or short, or in light that is poor, or using poor yarn with knots or contamination (the technical term for bits of old string – I found some in my 3 ply the other day), then you’ll know how it hampers what you can do. On the other hand I always thought that talking about which needles you prefer was a self indulgent American habit but here I am doing it. I didn’t like Knitpros when I first had a one but the ones I’ve got now I really like. I’m not sure I can tell the difference between them and some of the old Aero ones that I’ve had ages or got from the KCG but it’s lovely having shorter ones as they tangle less with the yarns. So I’ve had a chance in my caravan in the very West Wales to sit and knit uninterrupted and have made progress. I’m up to the thumb on the left glove and starting on the thumb on the right one. The Shepherd’s Plaid gloves are so far behind schedule that I decided to take a different tack. My self-imposed deadlines are obviously unrealistic, I just cannot make enough of the right sort of time to make them grow. I need silence, (total), a flat surface for the chart, excellent light (daylight or worklamp) and more than half an hour at a time. No interruptions at all. After deciding I didn’t like how they were progressing I took them both back to the cuff and started again. I redesigned how the thumb pattern works so that the pattern continues up from the rib without a break. I’ve put them on 2.25mm (UK13) needles, circulars, of which one is 100cm long but I’m managing ok. I decided to add initials and date as the SWRI pattern did not have that on this pattern, rather strange as they are on the others. I was going to try to do them as fast as possible to keep up with my timetable but that seems silly if I end up with gloves I don’t like. These were photographed in the garden in bright sunshine yesterday afternoon. Perfect knitting conditions. The Regia 3ply yarn from McAfee arrived by return of the order, and looking at it, I think it will be really perfect knitted up. It is fine and even and the colours are very good. The two marled greys are exactly what I have been looking for, the navy is good and dark and the ecru a good off white. 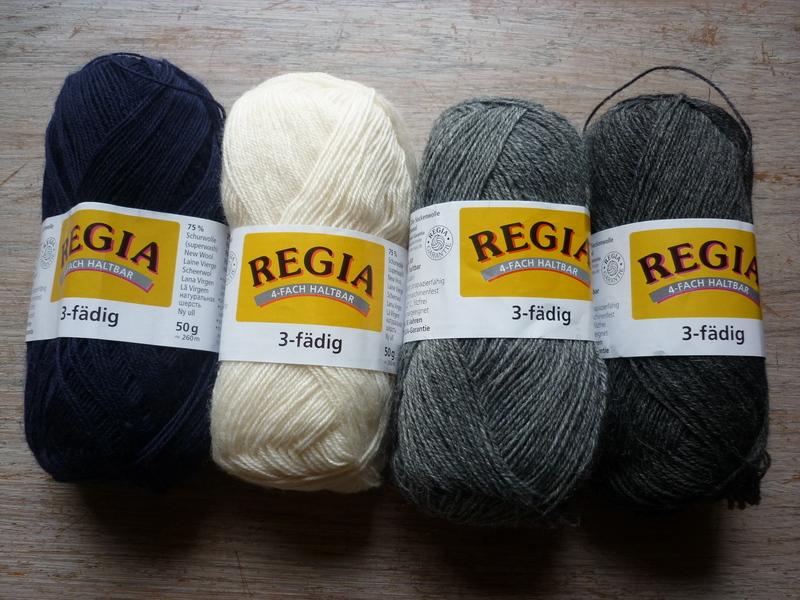 NOTE ADDED 31 MAY 2015: This is the yarn that is used in Sanquhar for knitting gloves. It is sold in the needlework shop in the town and also included in the kits that are sold with Alison Thomson’s books. 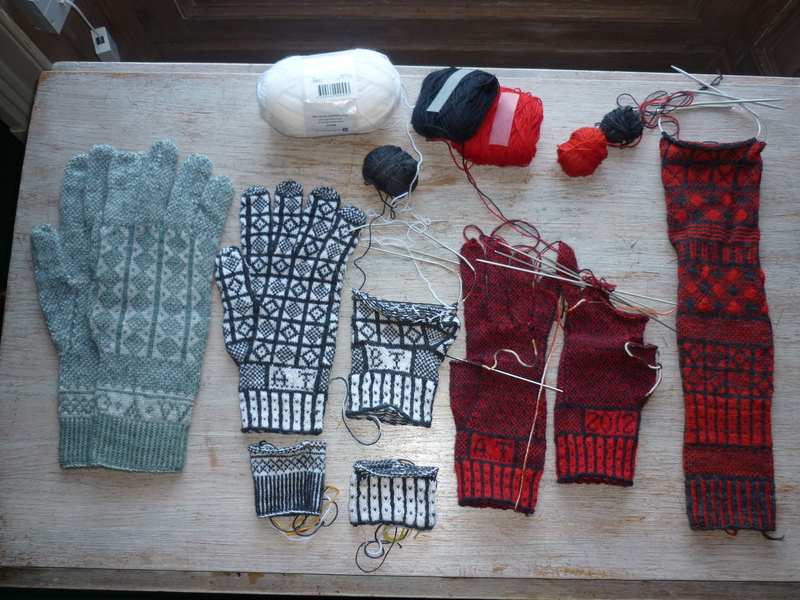 Left – right: Mary Allen gloves, complete. Sanquhar Duke pattern, one complete, one to be completed. Midge and Flea, in progress. Sampler of Sanquhar patterns, date to be knitted in and then cast off. There’s a variety of wools – 3 and 4 ply, double-pointed needles and circulars have been used and a variety of sizes. The 4 ply makes a surprising difference to the size, more than I would have expected. I’m undecided whether to persist with the idea of knitting all the patterns in the black and red 3 ply from Forsells. I don’t think it’s very evenly spun – probably ok for machine knitting where the knitting itself would be more even – I’m also not happy with the charcoal grey which is more black than I would have liked. Perhaps if I complete some of these other items it will give me time to decide what to do? This page has comments about the knitting process itself and references to academic writings about making. Most of these notes are from the start of the project. Distance and connecting via electronic means. Skill and the impossibility of making things identical. This is interesting as in principle if things are being made using the same methods and materials the outcome should be similar. This is the case in Japan with hand knits – I have seen the results myself, but it is not true in the UK. Again, I have seen the products. Avoids second glove syndrome but I never mind that anyway as I always work them together. Thinking Through Craft (Adamson 2007) is not what it’s title indicates. Most chapters discuss fine art and issues. I’ve reached the fingers of the first glove. 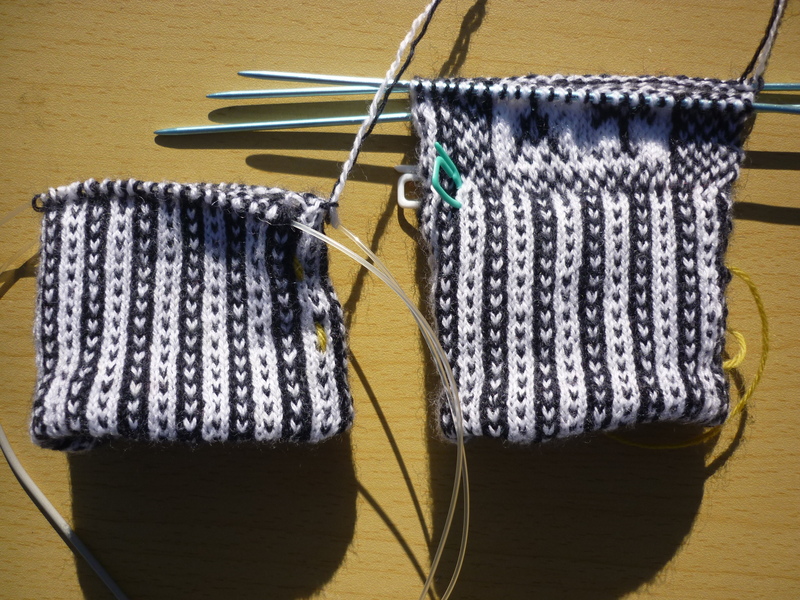 Very exciting as I’ve had to knit the finger gusset or fourchette, 9 stitches cast on between the fingers which is then knitted in alternate black and white. It’s quite good but think it will be better after another try. Also decided to knit the fingers on my special extra short 2mm needles but found that I just couldn’t hold them and after a couple of rounds went back to the circulars which although much longer than the actual finger stitches work much better. 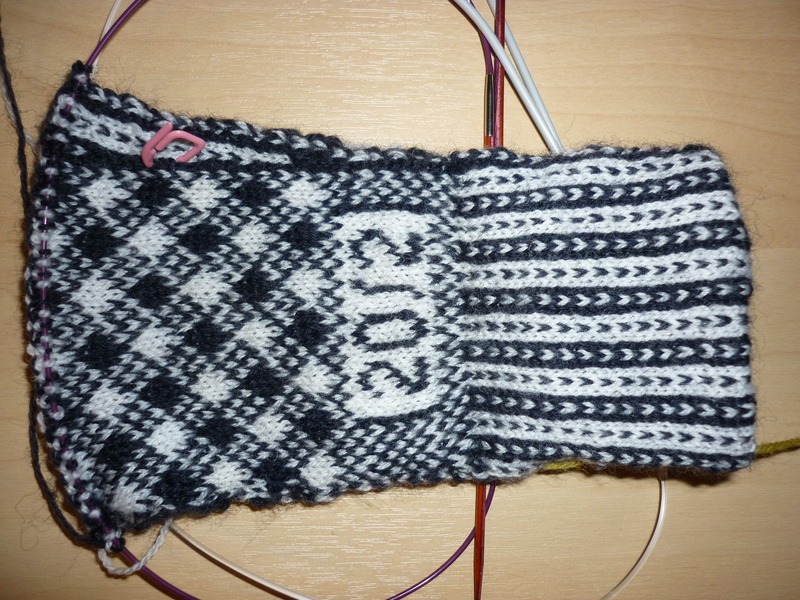 (2014, note to self: need to knit another pair of Sanquhar damrod based gloves before too long). One technical problem that I haven’t been able to solve is that of the ‘jog’ at the start/end of the round. I’ve looked at the Youtube videos about it and tried myself but all I got was a long slipped stitch. Will have to try again. (2014, I still have not solved this). I’m reviewing my techniques in the light of advice I’ve been given. Firstly to turn the knitting inside out on the needles to avoid bunching up of the floats especially bad at the ends of needles. Have a look at the diamond pattern on the red and grey sampler to see it at its worst. Secondly, to try knitting on circulars rather than dpns (double pointed needles). I’d done this in the past and wasn’t that impressed, actually I’m a real conservative where it comes to this type of thing. However, I had some in my extensive collection, almost the right size, 2.25 rather than 2 mm (old 14s) and I had a go using the red and grey sample piece. To my surprise I found that I liked the effect of them and my knitting became a lot more even and flat. So then I ordered a couple of 2mm 60cm needles from Texere who sent them in the post to me by return and I’ve been using them on the black and white ‘real glove’ to good effect. I’ve also corrected some mistakes in the stitches by dropping them down and picking up again. This knitting is like dressage, it has to be correct or not al all. That’s one reason why I wanted to start with this type of work. I went to visit the Rachel Kay Shuttleworth collection at Gawthorpe Hall. I asked to see the Dales gloves, all three of them, plus the curator had retrieved a pair of knitted mittens for me to look at as well. Working on the thumb gusset, see pictures. Very neat and satisfying to do. Using the Scottish Women’s Rural Institutes pattern but the thumb seems to be very high so I’m bringing it down a square. That is the same as the Sanquhar gloves that I actually own. They came via a friend from her aunty who knitted them and lived in the Yorkshire Dales. 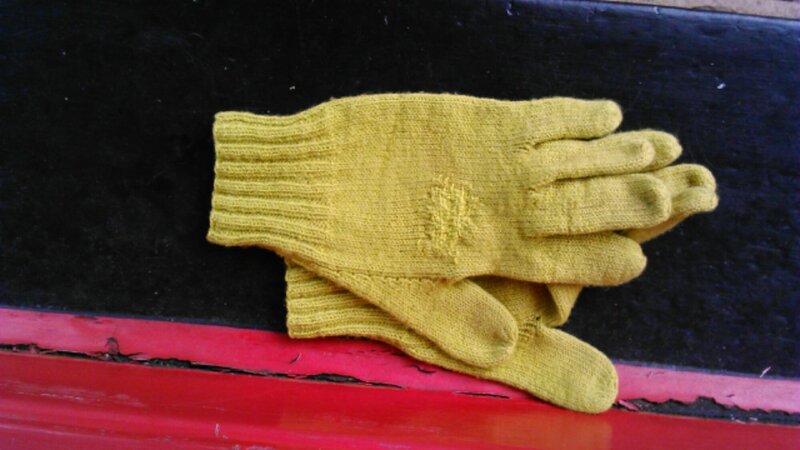 For a long while I thought they were Yorkshire Dales gloves, which in a sense they are. Started with the black and white glove cuff again as it was too untidy and am managing to get it better. I have done the initials and they were fine apart from I missed a stitch at the start of the round. Decided that it had to be undone. I’ve been able to do more as I’m on holiday in Spain so there’s been time to knit on the train; first Eurostar and then from Paris to Toulouse during the day. The ‘real’ glove. The knitting is trickier than I had thought – I am very used to knitting on four needles and also am able to knit quite tidy 4 ply gloves but the two colour rib was a struggle. I tried once and was so dissatisfied that I left it and started again, the tension on the white, in my left hand being much too loose. I also changed yarn from the baby wool 3 ply to the 2 ply version of the same wool. The key to the left hand yarn seems to be to keep it as tight in to the first finger as possible. If it goes loose your third finger ends up all over the place. Gawthorpe Hall. The Rachel Kay Shuttleworth collection has 3 Dales gloves, a pair knitted for ‘Miss Rachel’ and a single one that belonged to her father. I saw them as part of a study visit I made there in 1981! Dales Museum Hawes. They have some Dales gloves and I need to make and appointment to go and see them. Craven Museum Skipton. They only have lace gloves and no Dales ones as far as I can tell from a phone call. Welsh Folk Museum. I made an email enquiry and found that they don’t seem to have any knitted gloves, or if they do, they are not the ‘hand knitted’ type. I know they have rather good long socks with two colour patterns as they’re on display in the café area, framed. Knitting and Crochet Guild. 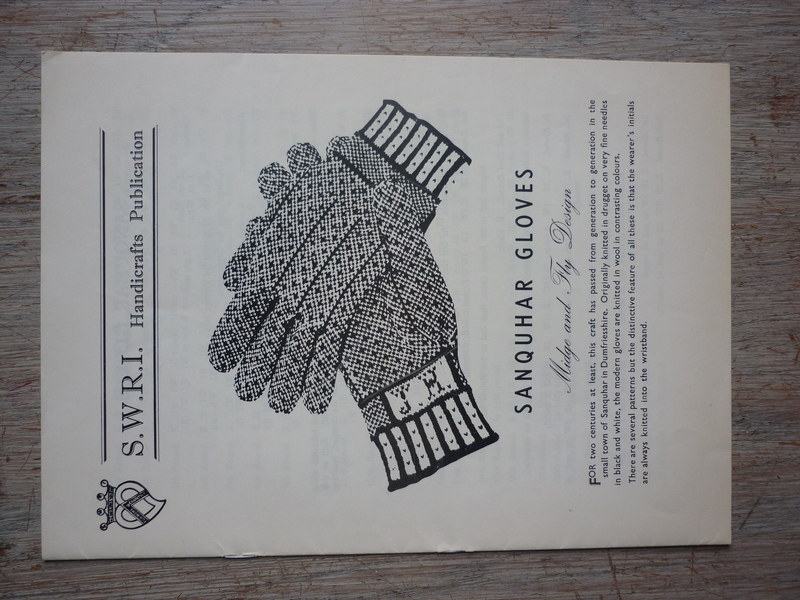 They have some patterns and leaflets: the four SWRI Sanquhar patterns and a People’s Friend pattern, also a leaflet from the Wanlockhead Museum Trust about machine knitted adaptations of Sanquhar patterns. there are probably some gloves but they are not accessible at the moment. The red and grey sampler. Changed needles on sample from short to longer, finding it hard to hold the shorter ones even though they are neater. Have done two repeats of the Duke pattern, now on two plain rounds. Shepherd’s Plaid. Difficult to place at first but then sorts itself out. The diamonds become easier to knit after a while, the key is the number of stitches at the start of the diamond. Also getting better at controlling the wool in the left hand, needs to be kept tighter down the finger so that the tension can be kept tighter.